This article contains photos of World War I Centennial 2018 Air Service Silver Medals. This medal is one of five produced by the United States Mint to commemorate branches of the U.S. Armed Forces that were active during the First World War. Earlier this year, on Jan. 17, the United States Mint released proof silver medals celebrating the Air Service, the Army, the Navy, the U.S. Marines and the U.S. Coast Guard. They were produced in support of and alongside of World War I Centennial Silver Dollars that commemorate the 100th anniversary of America’s involvement in WWI. 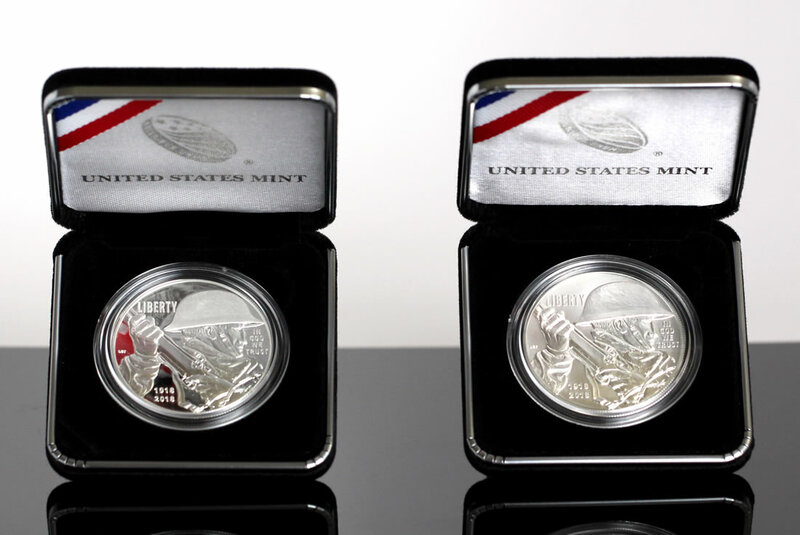 The silver dollars, struck in collector qualities of proof and uncirculated, were authorized by Congress under Public Law 113-212. 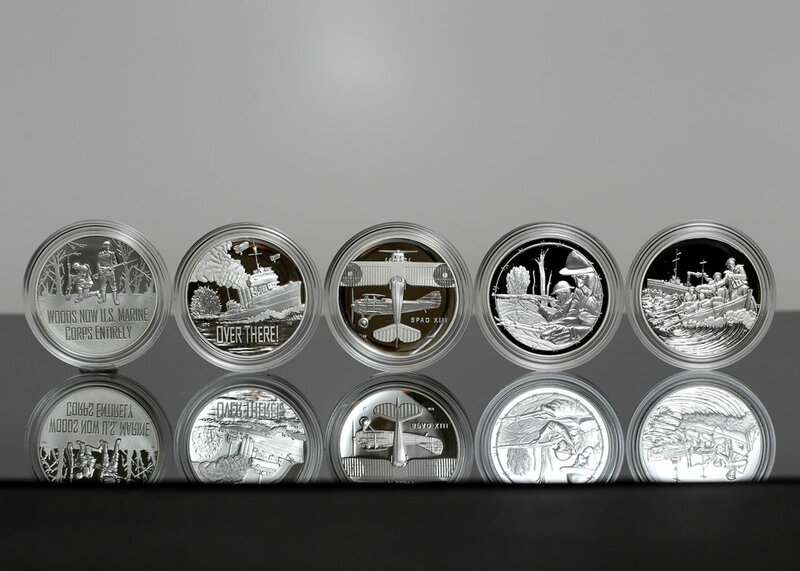 Each of the silver dollars is available until Dec. 27 with the proof priced at $56.95 and the uncirculated at $53.95. 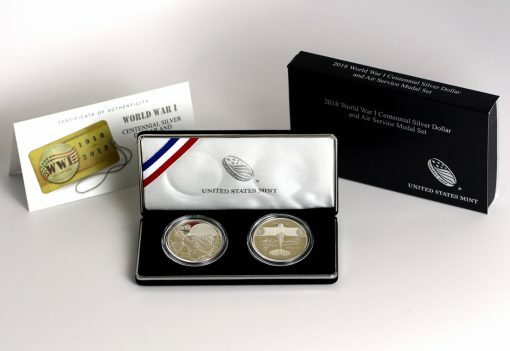 The medals are not sold individually or together, but instead each is paired with a proof WWI Silver Dollar and offered as a distinct set for $99.95. 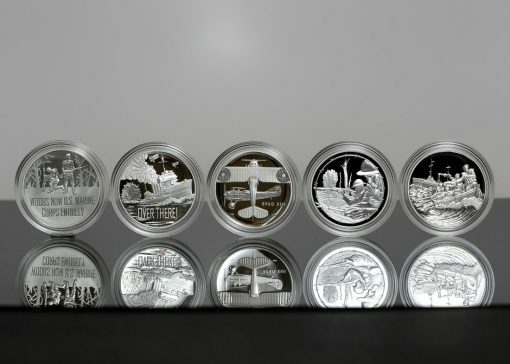 Those wanting all five medals have to buy all five sets. The sets originally had an ordering deadline of Feb. 20 but their sales reopened July 31. As of this writing, however, they are listed as "currently unavailable." The set with the Army silver medal has scored the most sales at 15,621; followed by close groupings of sets with the Marines medal at 12,648; the Air Service medal at 12,520; and the Navy medal at 12,253. 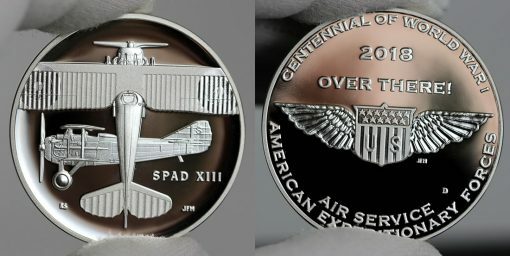 The set with Coast Guard medal trails them all at 9,812. Air Service silver medal obverses (heads side) show the iconic SPAD XIII, a World War I fighter flown by many Americans. The biplane was valued for its speed, strength, and firepower. 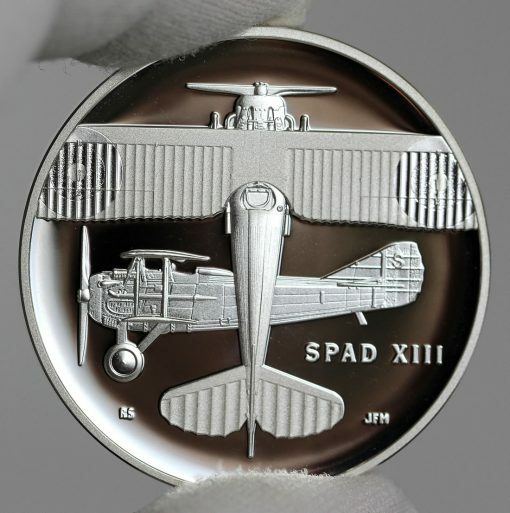 It is viewed on the medal from the top and side, along with an identifying inscription of SPAD XIII. 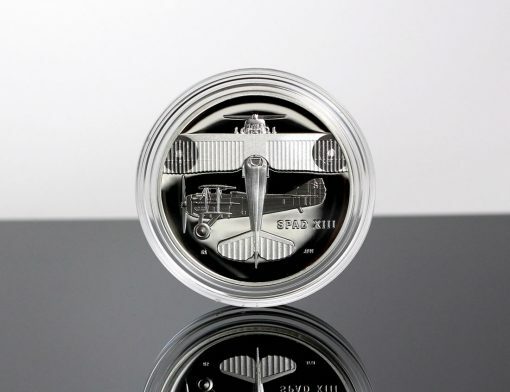 Ron Sanders designed the image and Joseph Menna sculpted it. 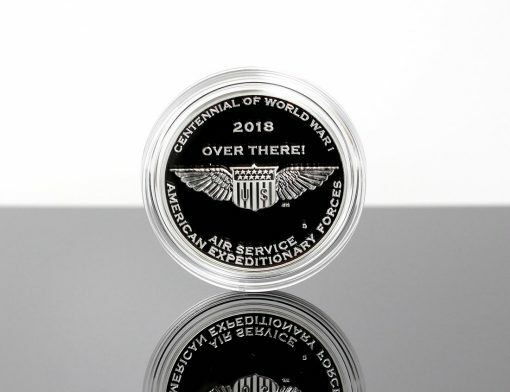 Also sculpted by Menna, reverses depict the Military Aviator Insignia with inscriptions of CENTENNIAL OF WORLD WAR I, 2018, OVER THERE!, AIR SERVICE, and AMERICAN EXPEDITIONARY FORCES. 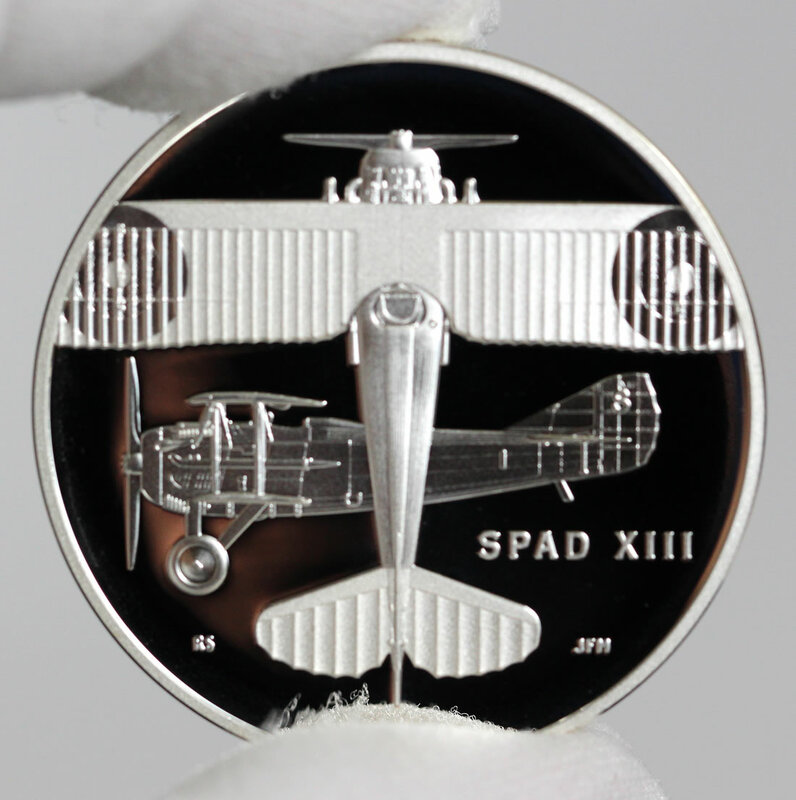 Produced at the Denver Mint, the reverse also has a "D" mint mark. 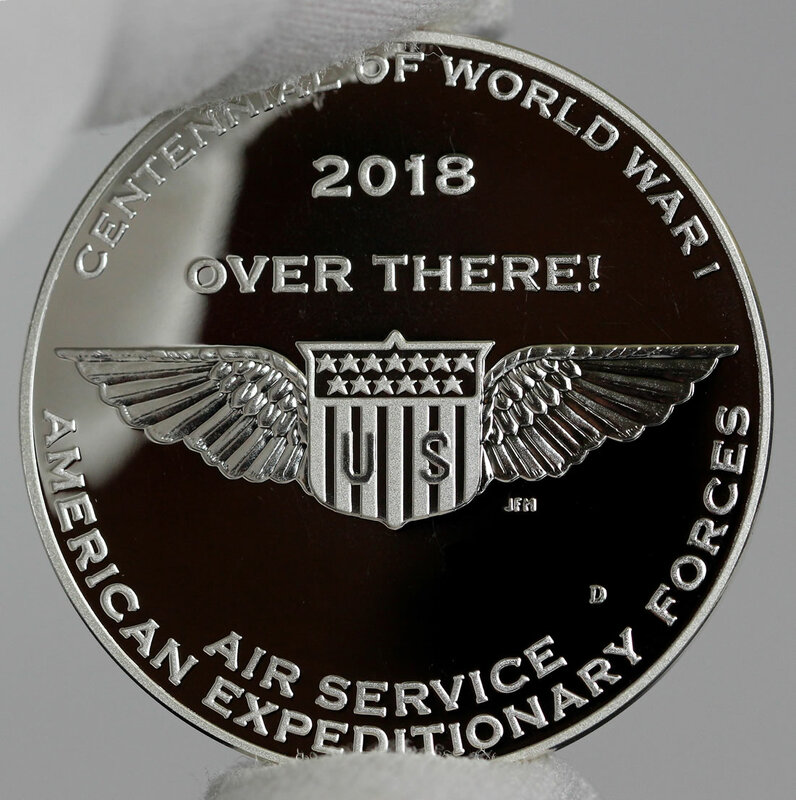 Each of the five medals and both WWI silver dollars share major specifications to include a composition of 90% silver and 10% copper, a weight of 26.730 grams, and a diameter of 1.500 inches. 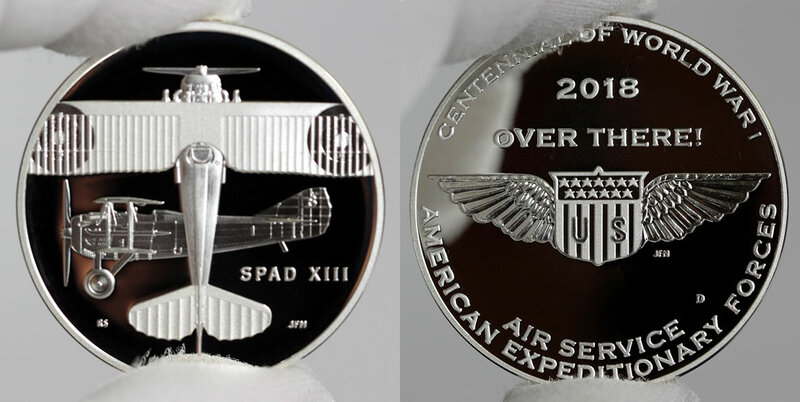 Their edges are different with the dollars reeded and the medals flat/plain. Purchase World War I Centennial Silver Dollars and look for the sets’ availability from the U.S. Mint’s commemorate online store right here. 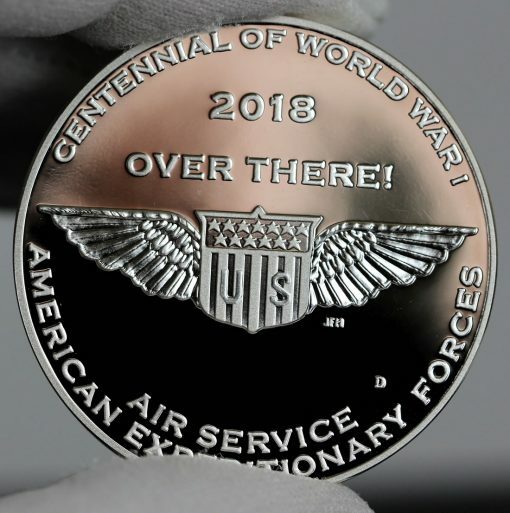 Below are a few more photos of World War I Centennial 2018 Air Service Silver Medals.